Under Stoner's guidance, Cassius Clay went on to win six Kentucky Golden Gloves titles, two national Golden Gloves titles, an Amateur Athletic Union National Title, and the Light Heavyweight gold medal in the 1960 Summer Olympics in Rome. Clay's amateur record was 100 wins with five losses. Clay wins the light-heavyweight gold medal at the Summer Olympics in Rome with a 5–0 decision over Poland's Zbigniew Pietrzykowski. 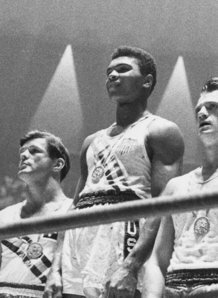 Cassius Marcellus Clay, later known as Muhammad Ali, first gained international prominence by winning the light-heavyweight boxing gold medal. Ghana's Ike Quartey became the first black African Olympic medallist when he claimed silver medal in light-welterweight boxing.